nose, for center-fire cartridges, should be .073" to .075". This diameter is taken just at the rear edge of the hemisphere that forms the actual point of the center-fire pin. The protrusion of the center-fire pin beyond the face of the breech, with the pin in the fired position, should be .055". These dimensions and shape of point apply to all center-fire firing-pins, whether for rifle, revolver, pistol or shotgun and, furthermore, they are highly important from a standpoint of both safety and efficiency. A properly proportioned and shaped center-fire firing-pin after impact on the primer. 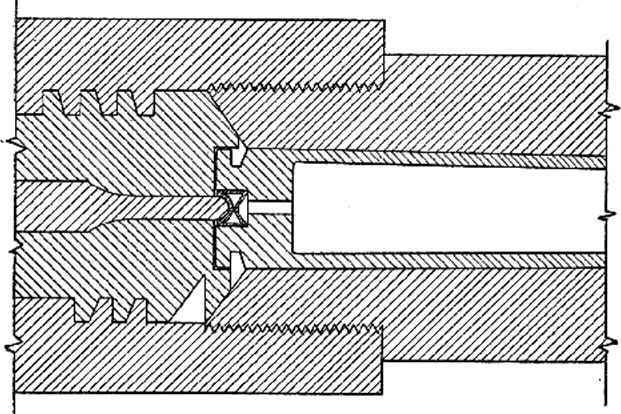 the entire hemisphere of the point is sunken within the primer at the instant the pressure of the fired charge comes back against the inside of the primer. This allows the firing-pin hole in the breech to practically be completely filled and sealed by the full diameter of the firing-pin behind the hemispherical point, preventing any pieces of brass, or gas under high pressure, coming back through the firing-pin hole in case a primer does rupture. 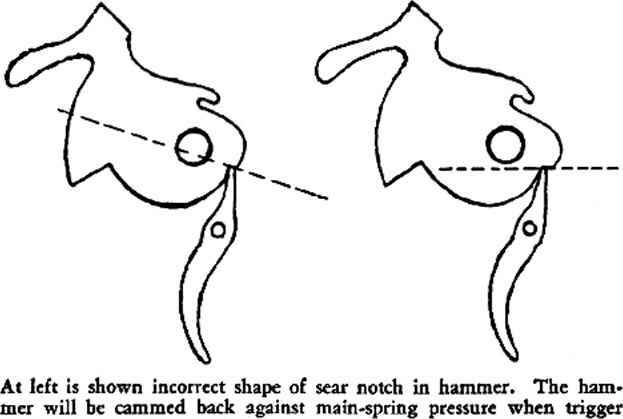 When the firing-pin nose is a larger diameter than the dimension given above, the hemispherical point is proportionally longer and in this case may easily be long enough so that in firing the firing-pin does not move far enough forward through the breech face to completely seal the hole through the breech face with the shank of the firing-pin back of the point and, in case of a ruptured primer, this allows pieces of brass or gas under high pressure to escape to the rear through the breech-block, which may easily cost the shooter the sight of an eye. Too large a center-fire firing-pin after impact. The rear face of the primer may cut out against the side walls. 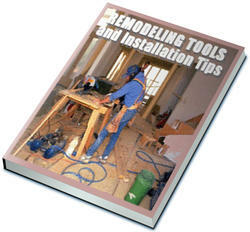 diameter is used, is that as the diameter of the firing-pin nose approaches the diameter of the primer there is a greater possibility of puncturing the primer by cutting the center of it out against the side walls, as the flexibility of the rear face of the primer is decreased as you approach its side walls. A sharp-pointed firing-pin will, of course, puncture a primer every time, so never make a firing-pin from a nail, using the point of the nail as a nose for the firing-pin. To illustrate this, let me tell you the experience of a friend of mine who was visiting a farmer acquaintance. This man saw a number of wild ducks on a pond in the farmer's pasture, so called the latter's attention to them. The farmer handed my friend a double-barrel shotgun, telling him to go ahead and shoot some of the ducks, which he started out to do. When within range, he took a shot with the right, modified-barrel at the ducks. As the gun fired he felt something strike his right hand, upon looking down saw some slivers of wood sticking in his hand and further saw a hole with splintered edges out through the grip of the stock. He immediately forgot all about the ducks and returned to the house with the shotgun, asked the farmer for a screw-driver and, taking the stock from the shotgun, removed the screw holding the left-hand firing-pin in place and took out the firing-pin. This firing-pin turned out to be a wire nail, with its original point being used as the nose of the firing-pin. The right-hand firing-pin was missing, having stripped the end off its stop-screw, passed out through the hole it broke through the grip of the stock and disappeared, luckily leaving my friend with nothing worse than a few splinters from the stock in his right hand. Had he been a left-handed shooter, or had he fired the left barrel first, he would have undoubtedly have lost an eye and perhaps his life. The farmer told him he had made those firing-pins himself, from wire nails, as the original firing-pins had both been broken. In the rim-fire firing-pins, in regard to shape of point, we have a different proposition. There are a number of different shapes of firing-pin noses that have been used, more or less successfully, for rim-fire work. These have, however, narrowed down to three shapes; the rectangular shape, at present far in lead of the other two in favor; the round, flat-end type, second in favor; and the rounded-end type, with few supporters. This last type is divided into two divisions, one using the rounded-end of a hemispherical shape, resembling the center-fire pin nose-shape but much larger in diameter, and the other a rectangular-shaped firing-pin nose with the end rounded like the side of a cylinder instead of being flat-ended, as is the rectangular-shaped nose most highly in favor. I*ft is impression made by the rectangular shape, flat-pointed rim-fire firing-pin on a .22 rim-fire ease. Right illustrates impression made upon same case by the round, flat-pointed, rim-fire firing-pin. the firing-pin blow, as we have only so much spring pressure available behind the firing-pin and must drive the firing-pin deeply enough into the case-rim to insure properly crushing the priming mixture to get good ignition. This is another point where the rounded-end firing-pin fails, as part of its power is consumed in what amounts to pushing the case-rim aside in the rounded sides of a semi-circular of hemispherically-shaped depression made in the rim by this shape of firing-pin nose, and there is little or no crushing action at these points. The depth of the depression made in the rim of a rim-fire case by the firing-pin should not be less than .015", and .020" minimum depth is a better assurance of even ignition from shot to shot. As mentioned above, we have only so much spring pressure available for power in driving the firing-pin, so to get this depth of depression in the case rim our firing-pin nose can be only so wide. This has to be determined for each make of action, as they differ considerably in weight of firing-pin, length of its travel and strength of spring. A firing-pin nose-width for the rectangular-shaped flat-nose pin, that will insure good ignition when driven to a proper depth in the case-rim, is .050" to .060". A proper diameter for the round, flat-nosed firing-pin, to give good ignition, is .075". The reason for the increased size of this nose over the rectangular one is that the entire diameter of the end of the pin must strike within the rim, not out over the edge, and as the impression in the case from this pin is a flat, circular depression, its full diameter is not available on that part of the rim which contains the priming mixture. Speed-actions introduce another difficulty, for it is seldom possible to get as much power behind the firing-pin in this type of action as in the slower type with the longer firing-pin travel. For this reason, these ac tions are only successful when using the rectangular-shaped firing-pin nose with the flat end, and are not too successful at that, because they have a narrow margin of power and some heavy oil or dirt causes them to fail completely, as does too stiff a cartridge case. These actions are at their best in high-grade target models, that are not subject to so much dirt as the guns used in the field and are usually given better care in regard to cleaning and proper oiling of the action. In these speed-actions, the width of the firing-nose is often reduced to give a deeper impression, a width of about .040" being used. This is permissible from a safety standpoint, as these speed-actions do not have sufficient drive to cause this narrowed firing-pin nose to puncture the case rim. These speed-actions work best on the target-type cartridge with its lower velocity and slightly softer case, rather than upon the highspeed cartridge with its very stiff case. The second type of firing-pin nose mentioned, the round type with a flat-end, requires a little more power than the rectangular type, as a greater portion of the end of this pin, due to its circular form, strikes on the head of the cartridge entirely inside the rim, where there is no priming mixture nor any way to crush it if there were any. This tends to have a cushioning effect on the firing-pin blow and while this shape is a good one, because it has small tendency to puncture a case unless it has very sharp edges or the end is very rough, it requires considerably more power than the rectangular shape to make as deep an indentation in the case-rim. For this reason it falls short of the rectangular shape in favor with the manufacturers. The round-bodied, rim-fire firing-pin with a hemisphcrically-shapcd end, showing end view, poor scaling of firing-pin hole in breech block and impression made by this shape pin on 22 rim-fire case. firing-pin, thus defeating its object of better ignition. Rectangular bodied, rim-fire firing-pin having end or point shaped like the side of a cylinder and impression made by such pin in a .22 rim-fire case. This is a poor shape to use. fore only be .0175" in diameter, a much smaller diameter than any firing-pin used. 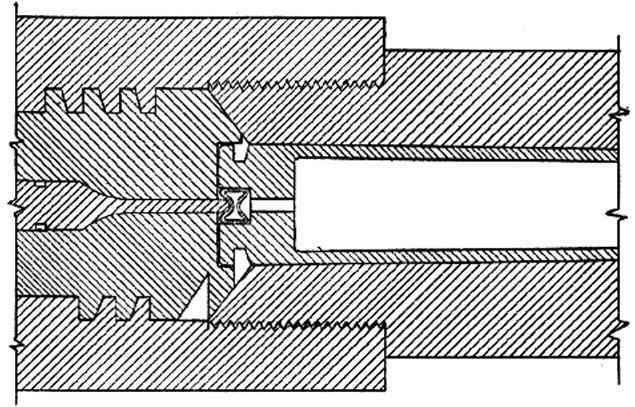 Therefore, our large-diameter firing-pin with a rounded or hemispherically-shaped point would fail to fill the firing-pin hole in the breech face, and would therefore fail to support the head of the cartridge, thus increasing the liability of a blowout and defeating our second supposition of greater safety from the liability of a blown case head. hang-fires or misfires from imperfectly primed cases, and as it offers no great advantages of any kind there is no reason for its use. A rim-fire case of .22 caliber is made of thin material, less than .010" in thickness. They are holding pressures of 20,000 pounds or more per square inch. They are made of brass and we all know that brass of that thickness has no real strength, yet these cases hold such pressures. They hold them because they are well supported by surrounding steel of the gun barrel and breech. Yet this steel cannot support them closely enough, because there must be some clearance to allow insertion and extraction with ease, to prevent movement and stretching of these cases under the pressure of firing. Yet these cases are being held rather tightly, at the one point, by the firing-pin. Therefore, the face or point of these firing-pins must be made as smooth as it is possible to make them, for any sharp edges or roughness of the firing-pin at this point will easily tear the thin case as it stretches and attempts to move under the pressure of the firing charge. This is an important point and do not neglect it. If a firing-pin end becomes rough, and they often do, through small particles of foreign matter in the metal of which the cases are made, and from a burst case now and then, resulting in a gas-cut on the pin, the pin should be replaced with a new one, because dressing the end of a rough pin to a new smooth surface results in shortening the pin and as the pin protrudes only .035" when new, a few stonings necessary to dress it up soon shortens it so that it becomes too short for good ignition. The type of pin made for the Colt Ace pistol is, of course, a different type that is too short to reach through the breech-block with the hammer down, made this way as a safety measure. It is a "free" or "floating" pin and drives forward under impact of the hammer, but its length of travel is limited just the same as pins of other type, so a few stonings will make it too short to function well also. Dirt, in connection with extractors and other parts, has been spoken of before but I wish to impress you with the fact that dirt in connection with firing-pins is just as bad, or worse. Heavy oil or grease will also have the same bad effect on ignition. The reason for this is that priming mixtures are made to be fired by percussion. The dictionary defines percussion as "the act of striking smartly on or against. The effect of violent collision." Dirt on any part of the firing-pin has the tendency of slowing down the speed of travel of the pin, whether the pin is struck by a hammer or driven by a spring. When we slow down the speed of travel we lose that "smartly" part of the definition, turning the firing-pin blow almost into a pressure, and pressure very seldom fires a priming mixture. I have crushed good center-fire primers in an arbor press to prove this without ever having one fire, although you notice I do not say that pressure will not fire a primer, for it may happen, but it happens very seldom. Firing-pins fit rather closely in the breech-block or bolt, and a little dirt on the sides or end of the body of the pin behind the breech face slows down the pin travel, until it loses that speed which makes of it a percussion instrument. When dirt is removed from the sides of the pin, or the hole in the breech-block in which the pin travels, examine these surfaces to see that no grit in the dirt has caused a roughness of these surfaces. If roughness is found, dress it off with fine polishing cloth, then wash the parts well in gasoline and re-oil with a thin oil which will not gum. Beware of too much oil, or too heavy an oil, in the hole in which the firing-pin travels, or you may make an oil-seal that will trap air in the hole and badly slow down the speed of firing-pin travel, resulting in a misfire. In very cold weather, all oil should be re moved from the firing-pin and the hole in the breechblock or bolt. Very fine, dry graphite, such as colloidal graphite, should be rubbed well over the dry pin, using the fingers to rub it into the surface. This will supply plenty of lubrication and will not thicken up in any temperature. This same advice of cleanliness and very light oils, or dry graphite, applies to the coil-spring back of the firing-pin in a bolt-action, to the sides of the hammer in a hammer-type action and to the spring behind the hammer. Speed-actions, of course, need special attention with thorough cleanings quite often, to keep up that speed necessary to develop percussion. How does a rimfire firing pin work? What is the firing pin protrusion on a 40x 22lr?